Draft problems are usually very simple and easily fixed when you understand the facts. The advice below will give you most of the information you need to solve most of your draft issues. Different beers will like to sit at different pressure. All beers like to sit in static state under a certain “Target” pressure. Each beer will have a slightly different carbonation level and therefore a slightly different “Target” pressure. Generally speaking most beers like to sit in the keg at between 0.8bar (12psi) to 1.0bar (14psi) at 4 degrees C. The issue is that at this pressure, you flow speed might be too fast or too slow. That is why you need to increase or decrease your beer line length and diameter so you can maintain the correct pouring speed and target pressure. Please refer to the table below which outlines target pressure concept. Different beers will vary from the figures in this table, but this is a fairly accurate guide for most draft beers. You will notice from the table below that the target pressure increases as the temperature increases. This is one of the reasons why you want to try to keep your kegs in an environment that has a constant temperature. Inside a coolroom or fridge is a great way to go. x = Beer can spoil at this temperature. Keep below to ensure beer freshness and carbonation. 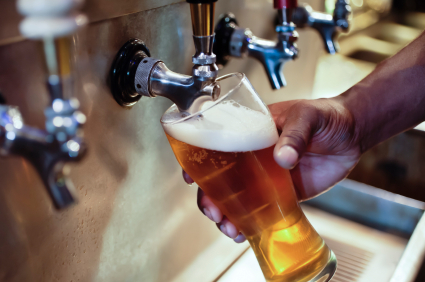 Balancing your keg system is all about putting the correct amount of resistance on your system so that you can maintain the target pressure while having the beer pour at the correct speed. If your system is below your target pressure your beer will eventually become flat, if your beer is above the target pressure your beer will slowly increase in carbonation and you will end up with an over carbonated beer which will produce a lot of head. 3. Use a flow restrictor tap (this will give you a small amount of control and should really be just used for fine adjustments. Clearly changing the height of the keg can be difficult or impractical. Flow restrictor taps will only give you a small amount of control for fine tuning, so basically the best option is to change the internal diameter or length of the beer line. 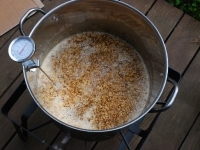 Increasing the length will obviously increase the resistance of beer to the tap (slowing the beer flow rate down). Also, decreasing the beer line diameter will also increase the resistance of beer to the tap (slowing the beer flow rate down). So for you to decide the correct beer line length and diameter you should refer to the table below. If you have balanced your keg system and you are still having issues with excessive foaming see below troubleshooting causes and solutions for your system. Beer drains from the lines during draws? Did you let the keg settle for 24 hours after bouncing it around in the back of your pick-up? Grab a 6 pack and let it chill. Improper holding of the glass? Glass must be held at a proper distance from the faucet – too close and there will be no head – too far and it will be all foam. Faucets should be opened fully and quickly. A faucet that is not opening quickly and fully will cause beer to foam. Yeast build up in faucet? Clean faucet daily with a good faucet brush. Scour all internal parts at least once a week and clean with BLC. Keep faucet cold to prevent yeast growth. Kinks, dents, twists in the beer line? Correct lay of the beer line as necessary. Sag or trap in the beer line? Since line lengths must be maintained route the line so as it is always leading up from the keg connector to the faucet. Spirals are a good way of using up extra line inside the beer system. The temperature at the faucet must be as cold as the keg. Beer line must be kept refrigerated. Insulation is not refrigeration. Keep lines away from hot spots like heater pipes, hot water pipes and steam pipes. No cold storage space for beer? Keep all kegs of beer refrigerated at all times. Never allow the keg to get above 5°C. Pressure should be maintained such that the beer will fill a 275ml glass in 4 seconds. Check for proper regulator function. Adjust the CO2 pressure as low as possible to maintain the proper beer flow above. No more than 18 psi should be applied to the keg. Check for defective air vents and restrictions caused by dents, kinks and contamination in the pressure line and valves. Always turn on the pressure before drawing the beer. Rotate stock and store beer below 5°C all the time to prevent secondary fermentation.